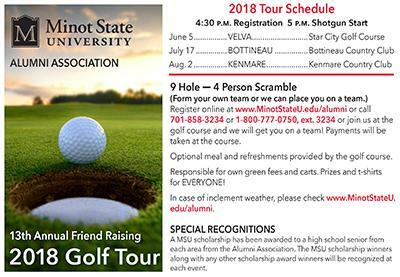 MINOT, N.D. – Minot State University alumni and friends are invited to the 13th annual Friend-raising Summer Golf Tour. This year, the tour will make three stops at courses in the state starting with Velva on June 5. The tour will also make stops at Bottineau on July 17 and finishes in Kenmare Aug. 2. Registration starts at 4:30 p.m. with a 5 p.m. shotgun start. All dates and times are subject to change. Each stop is a four-person, nine-hole scramble. A social will immediately follow each event and non-golfers are welcome. The MSU Alumni Association has provided Minot State with a scholarship for a high school senior from each area. The social event will recognize each scholarship recipient and other area students who have received a 2018-19 scholarship at MSU. Teams can register online at MinotStateU.edu/alumni or call (701) 858-3234 or 1 (800) 777-0750, ext. 3234, or join MSU at the course and get placed on a team. Payments will be accepted at the course. While there is no entry fee, golfers will be responsible for their own green fees and cart rentals. There will be an optional meal and refreshments at the course. Golfers interested in a cart should make early reservations due to limited availability. Prizes and T-shirts will be awarded at each event. For more information or in case of inclement weather, visit the MSU Alumni Association website at MinotStateU.edu/alumni.